Pergola tents are designed with optimum quality raw material and latest technologies and are offered in various colours, designs and patterns. Tents we offer are widely known for their simple installation, durability and reliability. It has usable floor space and can be used for leisure and enjoying weather. The pergola is also a great favourite for beach parties and elegant and sophisticated dinner or wedding. These are fabricated with attractive tent accessories and are made of cotton canvas with PVC laminated coated fabrics on both sides. 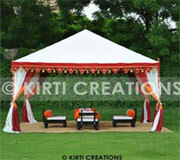 Intricately designed, this Splendid Pergola Tent enhances the beauty of your events. With the use of White, orange and maroon color fabric, the entire collection of tents is very elegant and provides aesthetic looks. The eye catchy and appealing designs provide a splendid beauty to ambiance.